When I joined Verv at the beginning of 2017 we had 9 employees and big plans for growth. Today we are up to 44 employees and counting – we expect to be up to 50 people in the next couple of months. Of course growth at that rate is fantastic, however it brings with it its own set of unique challenges. Sometimes it’s the issues that you can’t predict that prove to be the most trying. On one occasion our bank enforced random fraud checks on our salary payments as the wage bill went over a certain threshold. This resulted in some of our team members’ salaries being delayed by 24 hours. It was something we hadn’t even considered and took a lot of time and energy to sort out. Similarly, as we’ve grown, the need for new processes and policies has become much more necessary. We have had to adopt HR tools for booking time off and recording sick leave and have policies and procedures around reviews and career development. I am delighted to say we have now taken on a Head of People to ensure all our employees are invested in and they have the ability to reach their full potential. Despite the fact that we have grown to quite a larger team now, keeping our start-up culture is vital to our success. We have had our Customer Experience Manager ironing t-shirts, our Lead Developers cleaning out the fridge and our Machine Learning team carrying boxes down to the bins when we had an office clearout! SETsquared have really helped us to navigate the choppy waters of scaling up. We’ve taken part in pitch events and have gained a lot of insight from high quality audiences. We also had the opportunity to present to blue chip investors such as KPMG, an organisation we probably wouldn’t have had the opportunity to approach on our own. 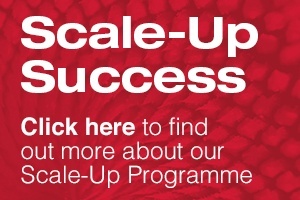 More recently, as part of the Scale Up pilot programme we’ve made the most of SETsquared’s access to research facilities and the Knowledge Transfer Partnership (KTP) to access R&D type resources without having to invest heavily to do it. My advice to other companies which are scaling up would be to be meticulous with who you hire, and who you choose to invest in your business. Don’t be desperate. Focus on your messaging and PR to sell the dream of what you’re trying to achieve and then you will get the right people coming to you. Investors especially need to be aligned with your vision for the company. They need to understand and buy into your big dream; it’s not just about the money. For us, that dream is to eradicate fuel poverty and we want both our employees and investors to share that same passion.